Brief Summary: Something about Global Warming and Conspiracy Theories. State of Fear features very fascinating, mind-numbing topics, and research regarding global warming - or the lack of. Unfortunately, the story surrounding the research--though at times interesting--is mostly cumbersome. As usual, the main character--Peter Evans--asks all the necessary questions setting up the usual long-winded Crichton answers. 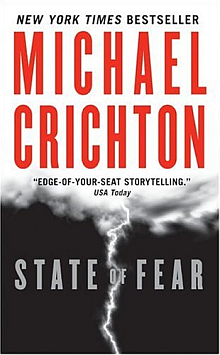 While some Crichton novels feature one know-it-all character surrounded by ignorant people, State of Fear features one ignorant person, Evans, who is constantly surrounded by people giving him all the answers. This method Crichton uses to spread his personal knowledge gets tiresome. The story itself bounces around for several chapters before it finally settles on Peter Evans who rises as the central character. Evans, a lawyer, is working for a firm that is in the middle of a litigation against those who pollute the earth. Eventually he gets involved with a government investigator, John Kenner, who believes anything about global warming is a scandel. Kenner takes Evans--and a couple of others, including the female lead--Sarah, around the world from Arizona to Antarctica to the Pacific Islands to stop a group who is trying to "force" global warming. While the story has some interesting scenes, the focus is on the controversial viewpoints regarding global warming. Crichton obviously believes--or at least has his own agenda--where he feels that we need to know we are being deceived by the government into believing that global warming is merely a tool the government uses to install a "State of Fear" in the general population. (Is he a Republican?) While he does make good--and even at time legitimate--points, I recommend reading this novel with "a grain of salt". While the story is generally flat, the characters weak--the educational information at times is rather enjoyable. Believable? Well, that is up to the reader.